"Sun, sun, sun, here it comes!" 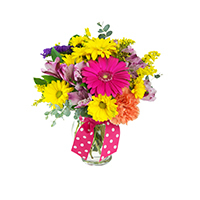 Bright arrangement with hot pink, orange, purple, and yellow flowers in a vase knotted with a polka-dotted ribbon. 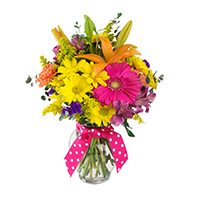 Flower types may vary; Designed with gerbera daisies, alstroemeria, carnations, daisy pompoms, statice, solidago aster, eucalyptus, and salal. 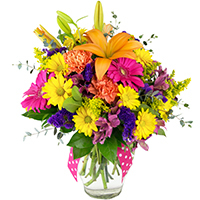 Deluxe, Premium, and Ultimate add Asiatic (scentless) lilies! 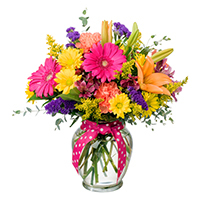 Clear glass vase measures 5"H (Standard), 6"H (Deluxe), 7"H (Premium), and 7.5" (Ultimate).